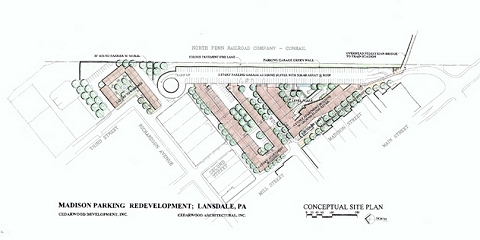 This Philadelphia suburb initiated a design competition for an irregular site adjacent to a substantial railroad yard that hosted commercial freight shipping lines and heavily used commuter rail with an historic station opposite side of the tracks. 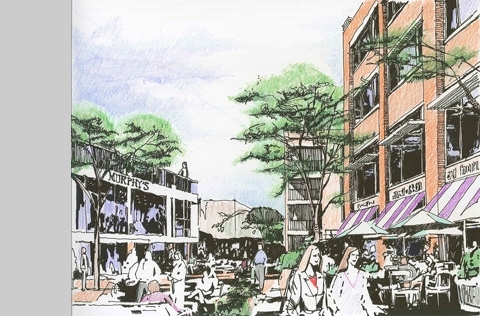 The RFP required replacement of the surface parking for the commuter rail and requested new retail and housing. Our design reflects a three-story parking structure as a visual and sound buffer to the railroad with a solar array on the roof. We closed a section of Madison St. to create a pedestrian street that would effectively lure resident and transit users to patronize the shops and restaurants one block behind Main Street retail. Two- and three-story multi-family apartments were organized around interior courtyards to create urban outdoor spaces as amenities. The submission was awarded First Place in the juried competition. Plans for implementation are proceeding.